The Pz.Kpfw. III Ausf. J (or Panzer III J) is a Rank I German medium tank with a battle rating of 2.3. It was introduced in Update 1.45 "Steel Generals". Large commander's cupola, often sticking out above the terrain, drawing enemy attention. The Panzerkampfwagen III medium tank, or the Panzer III was developed in the 1930s. Starting in early 1934, Heinz Guderian set down some specifications for a new tank, which Army Weapons Department took up to design the tank to weigh no more than 24,000 kilograms with a top speed of 35 km per hour. This tank's role was to be the main tank of the German army and was expected to destroy opposing tanks, as opposed as a tank made to destroy anti-tank guns and opposing infantrymen, which the Panzer IV took up in. Damlier-Benz, Krupp, MAN, and Rheinmetall produced prototypes meeting the specifications and the Damlier-Benz model was chosen after testing in 1936-1937. The Panzer III model used a leaf-spring suspension in its early models (Ausf. A - Ausf. D) before utilizing a six-wheeled torsion-bar suspension in the Ausf. E and beyond. The Panzer III had a crew of five people, the commander, gunner, loader, driver, and assistant driver. The best feature of the Panzer III during its introduction that is the most overlooked was the three-man turret, which was not as common at the time. This frees the commander to be able to effectively command the tank while maintaining situational awareness rather than be burdened by the role of a loader or gunner, improving combat effectiveness of the tank. Despite this rather advance design, the turret did not have a turret basket for the crew. It was a proven design and production began in May 1937. The total number of Panzer IIIs tanks constructed in its production life was 5,774 units (excluding StuG III variant). The Panzer III started with only 15 mm of armour on all sides, this was quickly upgraded to 30 mm on front, side, and rear on the Ausf. D, E, F, and G models. Then the Ausf. H placed an additional 30 mm of armour onto the front hull as an interim solution before the Panzer III Ausf. J gave the Panzer III a 50 mm armour thickness on the front and rear. The Panzer III Ausf. J still retained the 50 mm KwK 38 cannon from the Ausf. F, which provided much needed firepower over the 37 mm KwK 36. 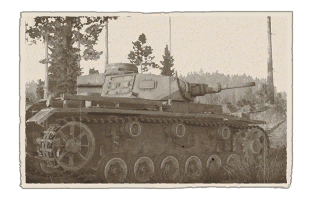 The Panzer Ausf. J had a 300 PS Maybach HL 120 TRM engine that gave it a top speed of about 40 km/h (25 mph) with a operational range of 155 km (96 mi.). The Panzer III Ausf. J gave the German army better armour for their Panzer III and with a better gun. However, it was still considered undergunned to the Soviet contemporary T-34 and KV-1 tanks as the 50 mm KwK 38 was not powerful enough to penetrate these tanks frontally with normal ammo. This requires the use of APCR, which was in low supply. The Soviet T-26 and BT series light tanks were still easily taken care of and were still in larger quantities than the T-34s and KVs, but T-34 production was kicking off and it won't be long before the T-34 becomes the main tank of the Red Army. The Panzer III still needed improvements if it ever was to go up against the more modern tanks and Germany needed it to stay in service as long as possible as their new tanks are being developed. The next variant featured additional armour and a better 50 mm cannon, the 50 mm KwK 39, on the Panzer III Ausf. J1. The armour had an additional 20 mm offset armour in the front hull and turret, plus the 50 mm KwK 39 featured a longer barrel than the 50 mm KwK 38, increasing its penetration values. 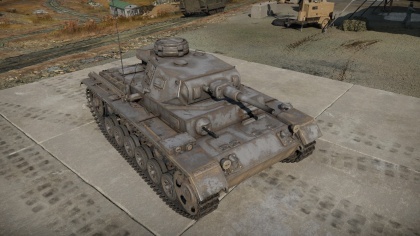 Skins and camouflages for the Panzer III Ausf.J from live.warthunder.com. There are plenty of category terms flying around. So looking through every one of them will be necessary. This page was last edited on 17 January 2019, at 07:05.